Specimen collection number SCL 15373 in the UBC Herbarium Algae Database. Search the collection number in the database for more information on these specimens, or search the species for further occurrences. Images courtesy of Sandra Lindstrom. ​This common green seaweed forms bright green to pale green hollow tubes that grow from a small holdfast, and can reach up to 20 cm in length. Groups of individual tubes often grow in clumps. Tubes can be pinched at random intervals, resembling intestines. The tubes tend to widen at the tip, and become yellow when reproductive. It is not uncommon to find this species bleached white after prolonged sun exposure. ​There are a few other green, tubular species that may be confused with U. intestinalis. 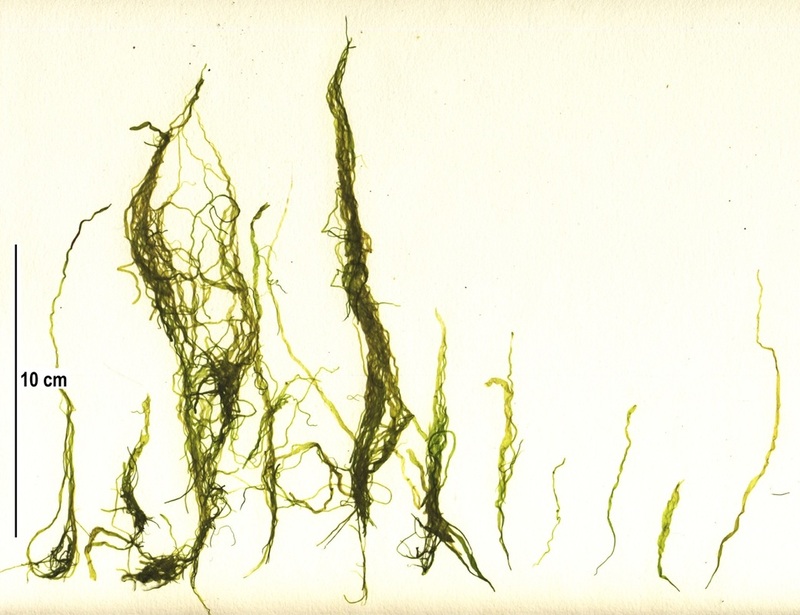 Dwarf sea hair (Blidingia minima var. minima) is shorter than U. intestinalis, not typically reaching more than 5-10 cm in length (U. intestinalis is usually ~ 20 cm). False northern thread (Pseudothrix borealis) is much narrower (~ 1 mm) than U. intestinalis (~ 5 mm) and typically only reaches about 10 cm in length. Green string lettuce (Ulva linza) is tubular only at the base of the plant, and quickly flattens into long (~45 cm) blades that are ruffled and much wider than U. intestinalis. ​This species can tolerate extremely low and extremely high saline environments. As a result, it is often found in high intertidal tidepools that remain out of the water for long periods of time, and thus become increasingly salty as evaporation occurs. Alternatively, this species also thrives in areas near freshwater run off, and in freshwater seepages above the high tide line. It typically grows attached to rocks, or free floating in protected areas. Its range extends from the Arctic Ocean, Bering Sea and Aleutian Islands, Alaska south to Mexico, and also includes Korea, Japan and Russia. In older guide books and publications, this species was known as Enteromorpha intestinalis. Druehl, L. 2000. Pacific Seaweeds: A guide to common seaweeds of the west coast. Harbour Publishing: Madeira Park, BC, Canada. Pp. 52-53. Lindberg, M. and Lindstrom, S.(2010).Blidingia minima var. minima. Seaweeds of Alaska. Accessed 2015-11-13. Lindberg, M. and Lindstrom, S. (2010). ​Ulva intestinalis. Seaweeds of Alaska. Accessed 2015-11-13. Lindberg, M. and Lindstrom, S. (2010). ​Ulva linza. Seaweeds of Alaska. Accessed 2015-11-13. Lindberg, M. and Lindstrom, S. (2010). Pseudothrix borealis. Seaweeds of Alaska. Accessed 2015-11-13. O'Clair, R. and Lindstrom, S. Ulva intestinalis Linnaeus. In Klinkenberg, Brian. (Ed.). E-Flora BC: Electronic Atlas of the Plants of British Columbia. Lab for Advanced Spatial Analysis, Department of Geography, University of British Columbia, Vancouver. Accessed 2015-11-12.